Epistaxis is the medical term for a nosebleed. Although temporary nasal drying or irritation causes most nosebleeds, frequent spontaneous epistaxis can be a symptom of underlying disease. Physical examination, blood tests and diagnostic imaging help determine the abnormality or disease causing a bloody nose. Hemophilia is an inherited disorder of the blood clotting, or coagulation, system. A group of blood proteins called coagulation factors reacts in sequence to form a blood clot. Hemophiliacs have decreased or abnormal clotting factors making them prone to bleeding. Frequent nosebleeds are a common symptom of hemophilia. The National Heart, Lung and Blood Institute states an estimated 18,000 Americans have hemophilia. Von Willebrand disease is another inherited bleeding disorder. The blood protein called von Willebrand factor is low or defective in this condition causing bleeding tendencies and abnormal clotting. Spontaneous nosebleeds are a common symptom of von Willebrand disease. Idiopathic thrombocytopenia purpura is a bleeding disorder affecting circulating blood elements called platelets. Platelets interact with blood clotting factors to form blood clots. With idiopathic thrombocytopenic purpura (ITP), a decreased number of platelets are in the circulation causing easy bruising and bleeding tendencies. Spontaneous bleeding from the gums and nosebleeds are frequent symptoms of ITP. Thrombotic thrombocytopenic purpura (TTP) is similar to ITP except with TTP the level of circulating platelets is low due to spontaneous formation of tiny blood clots. The clots use up the platelets causing a decreased number in the circulation. With a low level of circulating platelets, there is a tendency for spontaneous bleeding including epistaxis. Leukemia is cancer of the white blood cells. Blood cells and platelets are made in the bone marrow and released into the circulation. Leukemic cells divide uncontrollably taking over the bone marrow and decreasing the production of other blood elements including platelets. This results in a low level of circulating platelets and spontaneous bleeding tendencies. Frequent nosebleeds can be a presenting symptom of leukemia. The American Cancer Society estimates more than 44,750 American were newly diagnosed with leukemia in 2009. Aplastic anemia is a rare condition wherein the bone marrow stops producing blood cells and platelets. A markedly reduced level of circulating platelets causes spontaneous bleeding including frequent epistaxis. People with chronic liver disease often have significantly reduced platelets in the circulation. With chronic liver disease, the spleen may pull platelets out of the circulation or the bone marrow may not be producing sufficient platelets. Often, both of these problems contribute to low circulating platelet levels. As with other disorders that decrease platelets, nosebleeds and other spontaneously bleeding may occur. Hereditary hemorrhagic telangiectasia (HHT) is an inherited disorder that causes abnormal blood vessel formation. The malformed blood vessels can burst causing profuse bleeding. The nose is a frequent site of HHT malformations. 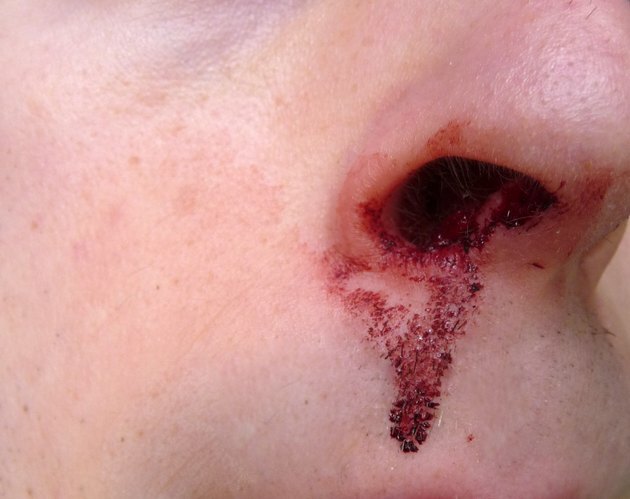 Nosebleeds associated with HHT generally bleed more heavily than nosebleeds caused by other disorders.